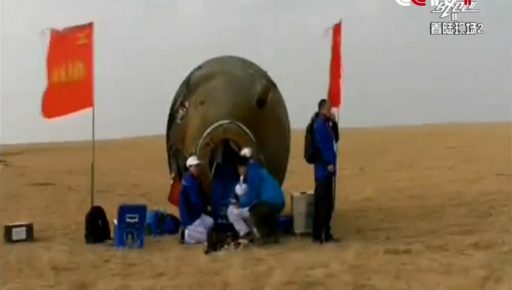 Shenzhou-11 departed the Tiangong-2 space laboratory Thursday morning for a day-long free flight to set up for a rocket-powered braking maneuver, a blazing re-entry and parachute-and-rocket-assisted landing in a remote area in Siziwang Banner, Inner Mongolia. Touchdown occurred at 5:59 UTC and both crewmen were reported in good condition after returning from their record-setting mission to space. 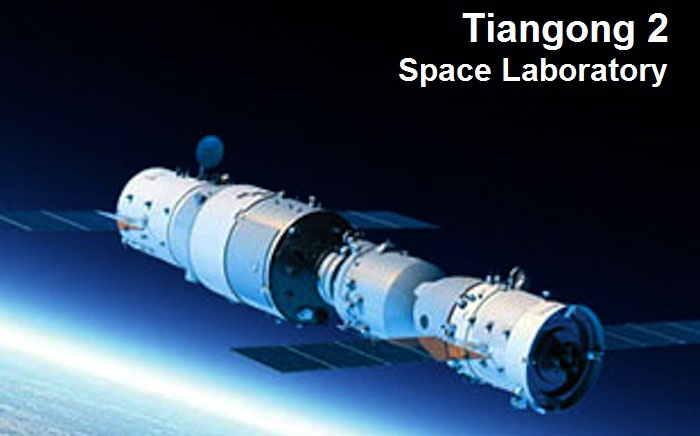 Tiangong-2, the second ‘Heavenly Palace,’ was launched into orbit in mid-September as China’s final stepping stone toward the deployment of a larger, modular space station later this decade to establish a constant human presence in space. 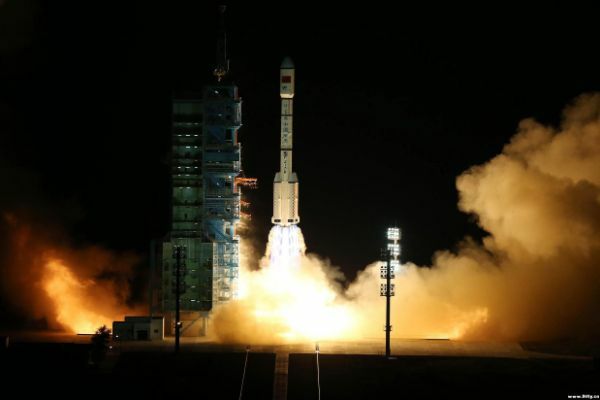 As such, the goals for the mission were to demonstrate China’s longest crewed flight to date and establish a cargo and propellant resupply architecture needed to support a long-term outpost. Shenzhou-11 is expected to be the only crewed mission to Tiangong-2, originally booked for a 20-day stay by a crew of three before the crew size was reduced to a pair of astronauts in favor of the longer flight duration. 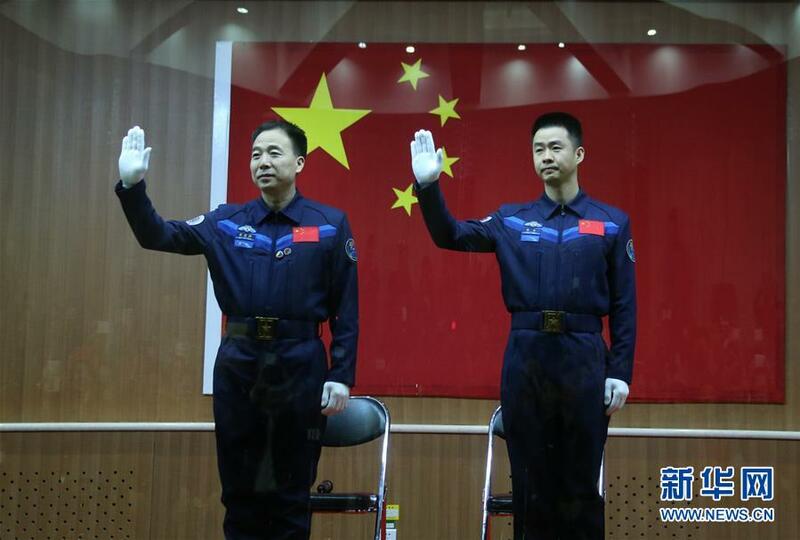 50-year old Jing Haipeng was chosen to command the mission after being part of the Shenzhou-9 crew that achieved China’s first crewed docking in space with the Tiangong-1 module. He and 38-year old flight engineer Chen Dong boarded their Shenzhou-11 spacecraft back on October 17 for an early Monday morning commute to space ahead of a two-day link-up with Tiangong-2 in its 385 Kilometer orbit. Taking up residence in their orbital home, the two crew members entered a busy routine of eight-hour work days, six days per week to tackle a busy scientific program that covered 14 different areas including human physiology, plant growth studies and various technical demonstrations. 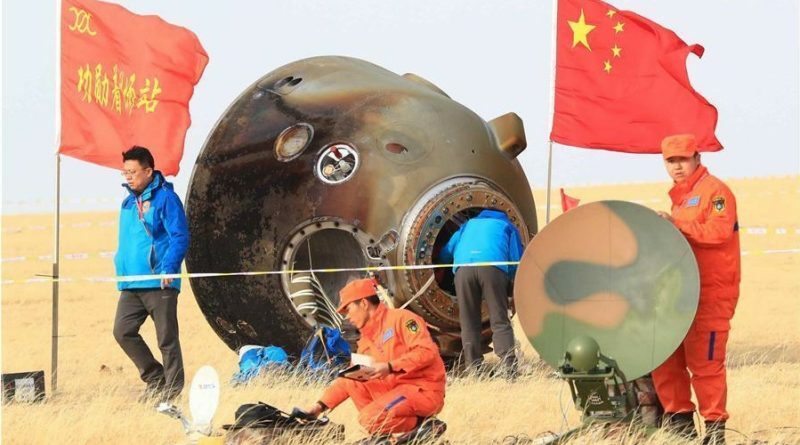 Over the course of their stay, the two crew members also looked at the facilities of Tiangong-2 and possible improvements to make long-term space habitats more comfortable for crews. On October 22, Tiangong-2 released the 40-Kilogram Banxing-2 companion satellite hosting high-resolution cameras to photograph the Tiangong-Shenzhou complex in orbit. Collecting an initial image set after release, BX-2 returned to the space lab in late October and snapped photos of the complex with Earth in the background. 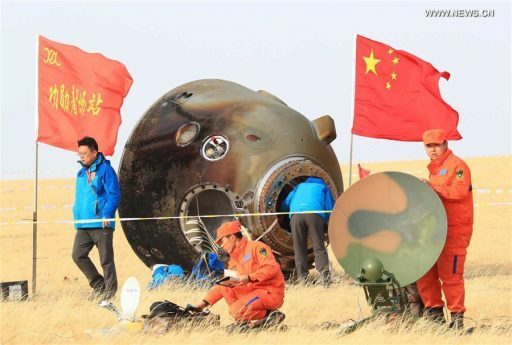 The two crew members were able to have a video conference with Chinese President Xi Jinping and talk to reporters in November before wrapping up their experiments and packing up for return. Before departing Tiangong-2, the two astronauts thanked their ground support teams for an outstanding mission. Having sealed the hatches of the two spacecraft, the two astronauts completed thorough leak checks and oversaw an automated undocking of the Shenzhou-11 spacecraft at 4:41 UTC on Thursday after a docked mission of 29 days and 9 hours. Leaving their orbital home in the rear view mirror, the astronauts settled in aboard Shenzhou-11 for another day of free flying before returning to Earth. 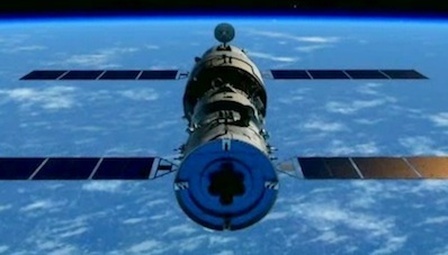 The spacecraft remained in the same general orbit as Tiangong-2 but drifted to a safe distance to the space lab ahead of the deorbit burn. 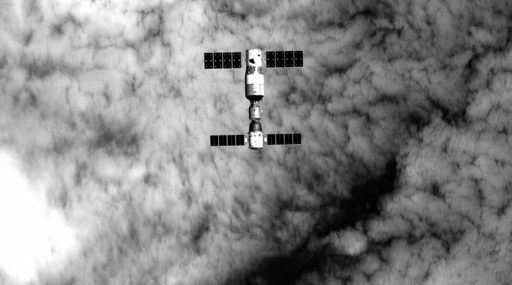 The Orbital Module was depressurized in the first step of the crew’s homecoming to set up for its separation completed just after 5 UTC on Friday. 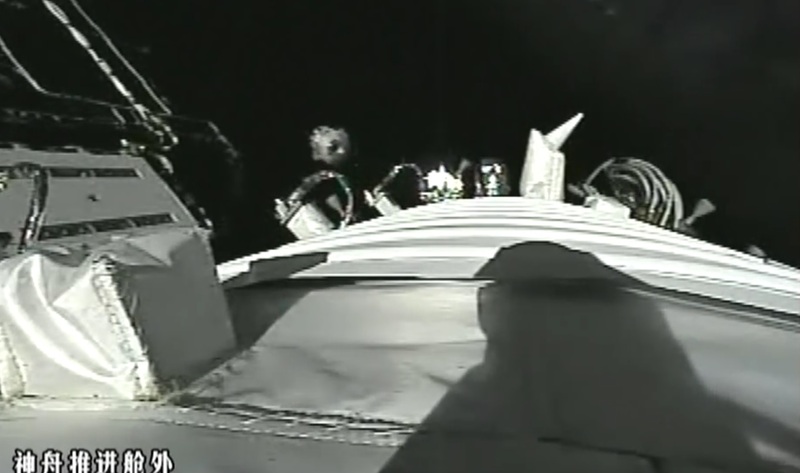 As is customary for Shenzhou missions, the 2.8 by 2.25-meter module remains in orbit to continue operating for some time ahead of a slow orbital decay. Shenzhou-11 fired up its four high-thrust main engines at 5:11 UTC to hit the brakes with a thrust of one metric-ton force. The burn lasted around 75 seconds and slowed the spacecraft just enough to drop out of its 380-Kilometer orbit and intercept the dense atmosphere at the correct angle. With no more turning back, Shenzhou-11 separated its Service Module at approximately 5:35 UTC – leaving it to burn up in the atmosphere after supporting the Shenzhou spacecraft for its longest mission to date, hosting the power-generating solar arrays, propulsion and attitude control systems. 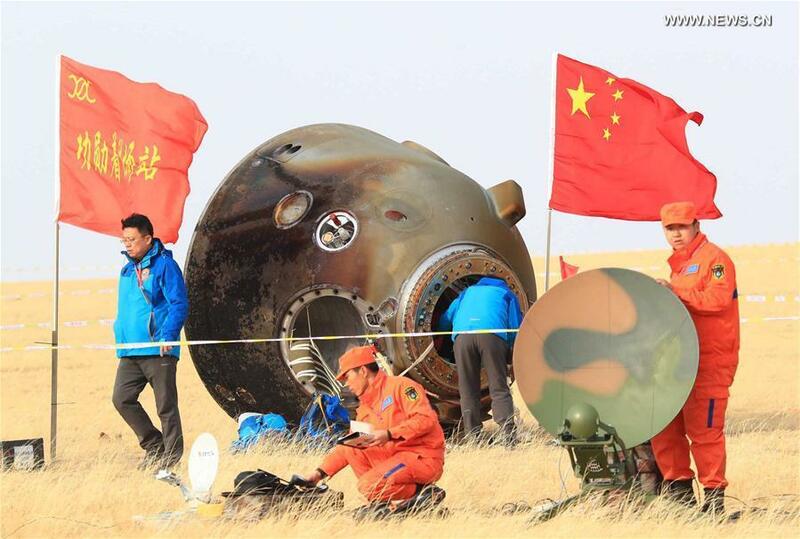 The two astronauts entrusted their lives to the Shenzhou-11 Entry Module – 2.50 meters tall and 2.52 meters in diameter with a total mass of 3,200 Kilograms, outfitted with eight Hydrazine thrusters for orientation maneuvers. 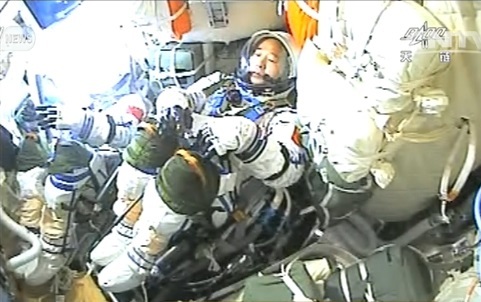 Shenzhou-11 swung around to its pre-bank angle attitude in preparation for the dive into the dense atmosphere. Tracking camera footage showed the capsule re-entering the atmosphere at 5:39 UTC – initially sticking to a fixed attitude before processing navigation data and adjusting its angle of attack to modify lift on the vehicle to actively control the flight path toward the target landing site. Enduring temperatures in excess of 1,500°C, the Entry Module slowed down in the atmosphere to subsonic speeds for the deployment of the parachutes – a three-step process. Pilot chutes were used to pull out the Drogue Chute that stabilized the craft and slowed it down to create safe conditions for the deployment of the 1,200-square-meter main chute. Long-range tracking footage showed the deployment of the chutes at 5:47 UTC followed a few minutes later by Shenzhou dropping its heat shield to expose the landing engines and altimeter system to gather precise altitude data to coordinate landing events. While from a visible point of view, the events comprising the return sequence were seemingly flawless, Shenzhou-11 apparently overshot its landing spot by more than 100 Kilometers. No reason for the considerable landing error had been given in the hours after the landing. Touchdown occurred at 5:59 UTC and was cushioned by firing six solid-fueled rockets when the capsule was just one meter above ground. Because the vehicle landed long and due to poor visibility, it took recovery forces nearly ten minutes to confirm the safe touchdown and locate the spacecraft. 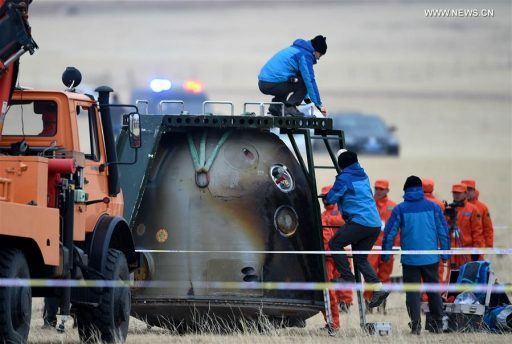 Both crew members were extracted from the module in good health, according to official state media reports – marking the successful conclusion of the Shenzhou-11 mission, China’s sixth crewed mission. 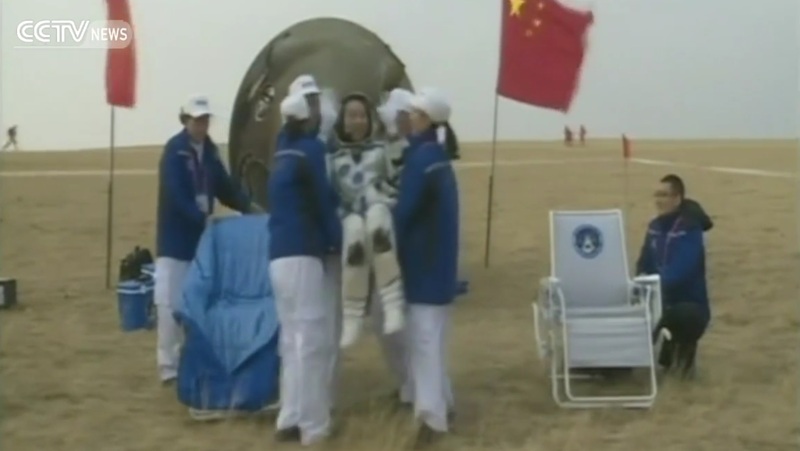 The flight had a duration of 32 days, six hours and 25 minutes – more than doubling China’s previous record for the longest crewed mission to space. The astronauts were to return to Beijing for post-flight exams and various experiments to study how their long stay in space affected their bodies. With the crew’s successful homecoming, Tiangong-2 is entering the second phase of its mission that will last up to five years. 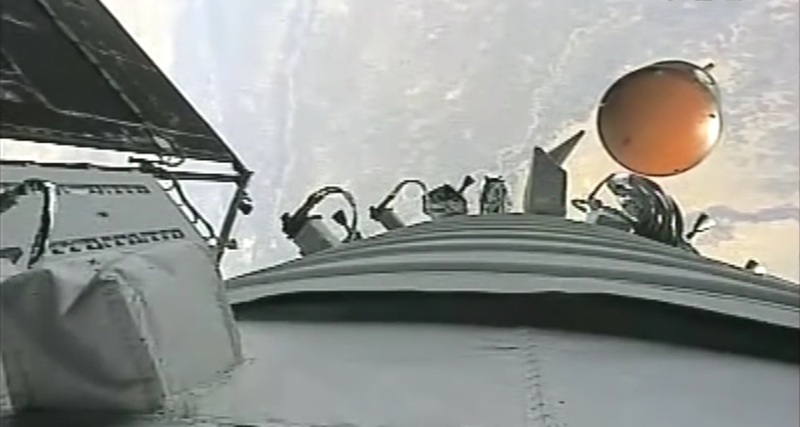 Remote-controlled payloads installed on the vehicle will be re-activated in the coming days after being turned off while the crew was on board. Tiangong-2 hosts the POLAR gamma-ray detector that studies gamma-ray bursts from deep space, a fountain atomic clock that is more accurate that current space-based systems, and an Earth-science payload comprising a microwave altimeter for Earth surface and ocean monitoring, a wide-field imager for ocean and land surveys as well as a multispectral spectrometer for atmospheric science. In the first half of 2017, Tiangong-2 will participate in another important demonstration to establish China’s Low Earth Orbit cargo architecture. Lifting off on a Long March 7 rocket, the first Tianzhou cargo vessel will be tasked with an automatic link-up with the Tiangong-2 craft ahead of a propellant transfer demo – a critical requirement when aiming to keep a large space station in orbit for an extended period of time. Pre the current plan, China expects to launch the Tianhe Core Module of the Chinese Space Station (CSS) in 2018 atop a powerful Long March 5 rocket. Ultimately, CSS will consist of at least three modules and have a mass of up to eighty metric tons, offering living and working space for three to six astronauts who will complete half-year missions. 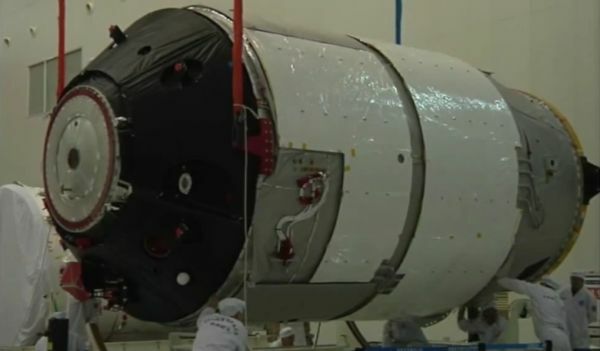 Barring any surprises, China’s next crewed mission will not come until 2018 when the Tianhe core module is in orbit. A new round of astronaut selections will come in 2017 and allow access to the program for a wider area of professions. To date, only military pilots were selected for China’s astronaut program to participate in the country’s first steps in crewed space exploration. Transitioning to a stage of in-space research, China will also look for experts in science and engineering to become residents of their future space station.